"Sugi" redirects here. For other uses, see Sugi (disambiguation). For other uses, see Cryptomeria (disambiguation). Cryptomeria (literally "hidden parts") is a monotypic genus of conifer in the cypress family Cupressaceae, formerly belonging to the family Taxodiaceae. It includes only one species, Cryptomeria japonica (syn. Cupressus japonica L.f.). It is endemic to Japan, where it is known as sugi (Japanese: 杉). The tree is called Japanese sugi pine or Japanese red-cedar in English. It is a very large evergreen tree, reaching up to 70 m (230 ft) tall and 4 m (13 ft) trunk diameter, with red-brown bark which peels in vertical strips. The leaves are arranged spirally, needle-like, 0.5–1 cm (1⁄4–3⁄8 in) long; and the seed cones globular, 1–2 cm (1⁄2–3⁄4 in) diameter with about 20–40 scales. It is superficially similar to the related giant sequoia (Sequoiadendron giganteum), from which it can be differentiated by the longer leaves (under 0.5 cm or 1⁄4 in in the giant sequoia) and smaller cones (4–6 cm or 1 1⁄2–2 1⁄4 in in the giant sequoia), and the harder bark on the trunk (thick, soft and spongy in giant sequoia). Sugi has been cultivated in China for so long that it is frequently thought to be native there. Forms selected for ornament and timber production long ago in China have been described as a distinct variety Cryptomeria japonica var. sinensis (or even a distinct species, Cryptomeria fortunei), but they do not differ from the full range of variation found in the wild in Japan, and there is no definite evidence the species ever occurred wild in China. Genetic analysis of the most famous Chinese population of Cryptomeria japonica var. sinensis on Tianmu Mountain, containing trees estimated to be nearly 1000 years old, supports the hypothesis that the population originates from an introduction. The earliest fossil record of Cryptomeria are descriptions based on vegetative organs of †Cryptomeria kamtschatica of the Late Eocene from Kamchatka, Russia and †Cryptomeria protojaponica and †Cryptomeria sichotensis from the Oligocene of Primorye, Russia. Several fossil leafy shots of †Cryptomeria yunnanensis have been described from Rupelian stage strata of the Lühe Basin in Yunnan, China. 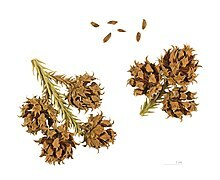 For the Neogene, Cryptomeria is well represented as seed cones, leafy shoots and wood in the fossil records of Europe and Japan. †Cryptomeria rhenana was described from the early Late Miocene to the Late Miocene of Rhein in Morsbach, Germany, from the Early and Middle Pliocene of Northern Italy, to the Middle Pliocene of Dunarobba, Italy and to the Early Pleistocene of Umbria, Italy. † Cryptomeria anglicawas described from the Late Miocene of La Cerdana, Spain, to the Late Middle Miocene of Brjánslækur, Iceland and from the Late Miocene to the early Pliocene of Derbyshire, England. †Cryptomeria miyataensis was described from the Late Miocene of Akita, Japan. Cryptomeria japonica was described from the Late Miocene of Georgia and from the Pliocene of Duab, Abkhazia. It has also been described from the Pliocene of Honshu, Japan, Late Pliocene of Osaka, Japan and from the Pleistocene of Kyushu, Japan. Cryptomeria japonica timber is extremely fragrant, weather and insect resistant, soft, and with a low density. The timber is used for the making of staves, tubs, casks, furniture and other indoor applications. Easy to saw and season, it is favoured for light construction, boxes, veneers and plywood. Wood that has been buried turns dark green and is much valued. Resin from the tree contains cryptopimaric and phenolic acid. The wood is pleasantly scented, reddish-pink in colour, lightweight but strong, waterproof and resistant to decay. It is favoured in Japan for all types of construction work as well as interior panelling, etc. In Darjeeling district and Sikkim in India, where it is one of the most widely growing trees, C. japonica is called Dhuppi and is favoured for its light wood, extensively used in house building. In dry air conditions, the initial density of Japanese cedar timber has been determined to be about 300–420 kg/m3. It displays a Young's modulus of 8017 MPa, 753 MPa and 275 MPa in the longitudinal, radial and tangential direction in relation to the wood fibers. Cryptomeria japonica is extensively used in forestry plantations in Japan, China and the Azores islands, and is widely cultivated as an ornamental tree in other temperate areas, including Britain, Europe, North America and eastern Himalaya regions of Nepal and India. Sugi is the national tree of Japan, commonly planted around temples and shrines, with many hugely impressive trees planted centuries ago. Sargent (1894; The Forest Flora of Japan) recorded the instance of a daimyō (feudal lord) who was too poor to donate a stone lantern at the funeral of the shōgun Tokugawa Ieyasu (1543–1616) at Nikkō Tōshō-gū, but requested instead to be allowed to plant an avenue of sugi, so that "future visitors might be protected from the heat of the sun". The offer was accepted; the Cedar Avenue of Nikkō, which still exists, is over 65 km (40 mi) long, and "has not its equal in stately grandeur". Jōmon Sugi (縄文杉) is a large cryptomeria tree located on Yakushima, a UNESCO World Heritage Site, in Japan. It is the oldest and largest among the old-growth cryptomeria trees on the island, and is estimated to be between 2,170 and 7,200 years old. ^ Thomas, P.; Katsuki, T. & Farjon, A. (2013). "Cryptomeria japonica". The IUCN Red List of Threatened Species. IUCN. 2013: e.T39149A2886821. doi:10.2305/IUCN.UK.2013-1.RLTS.T39149A2886821.en. Retrieved 4 December 2017. ^ This kanji for sugi is the same as the hanzi for shan, which is used for other species, for instance, shui shan, water fir, Metasequoia glyptostroboides. ^ "Cryptomeria japonica". Natural Resources Conservation Service PLANTS Database. USDA. Retrieved 17 January 2016. ^ Chen, Y.; Yang, S. Z.; Zhao, M. S.; Ni, B. Y.; Liu, L.; Chen, X. Y. (2008). "Demographic Genetic Structure of Cryptomeria japonica var. sinensis in Tianmushan Nature Reserve, China". Journal of Integrative Plant Biology. 50 (9): 1171–1177. doi:10.1111/j.1744-7909.2008.00725.x. PMID 18924282. ^ Fu, Liguo; Yu, Yong-fu; Mill, Robert R. "Cryptomeria". Flora of China. 4 – via eFloras.org, Missouri Botanical Garden, St. Louis, MO & Harvard University Herbaria, Cambridge, MA. ^ Ding, Wen-Na; Kunzmannd, Lutz; Su, Tao; Huang, Jian; Zhou, Zhe-Kun (January 2018). "A new fossil species of Cryptomeria (Cupressaceae) from the Rupelian of the Lühe Basin, Yunnan, East Asia: Implications for palaeobiogeography and palaeoecology". Review of Palaeobotany and Palynology. 248: 41–51. 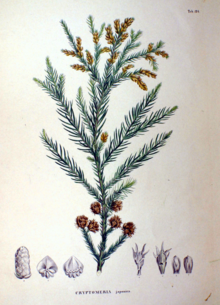 ^ "Cryptomeria jponica" (PDF). World Agroforestry Centre. Retrieved 4 December 2014. ^ a b B. Anshari; Z.W. Guan; A. Kitamori; K. Jung; I. Hassel; K. Komatsub (2010). "Mechanical and moisture-dependent swelling properties of compressed Japanese cedar". Construction and Building Materials. 25 (4): 1718–1725. doi:10.1016/j.conbuildmat.2010.11.095. ^ "AGM Plants - Ornamental" (PDF). Royal Horticultural Society. July 2017. p. 25. Retrieved 24 January 2018. ^ "RHS Plant Selector - Cryptomeria japonica". Retrieved 18 June 2013. ^ "RHS Plant Selector - Cryptomeria japonica 'Bandai-sugi'". Retrieved 18 June 2013. ^ "RHS Plant Selector - Cryptomeria japonica 'Elegans Compacta'". Retrieved 18 June 2013. ^ "RHS Plant Selector - Cryptomeria japonica 'Globosa Nana'". Retrieved 18 June 2013. ^ "RHS Plant Selector - Cryptomeria japonica 'Vilmoriniana'". Retrieved 18 June 2013. ^ Sargent, Charles Sprague (1893). "Notes on the Forest Flora of Japan". Garden and Forest. 6 (296): 442–443. ^ "Vandals damage Japan's World Heritage tree". UPI NewsTrack. 2005-05-25. Retrieved 2008-08-25. ^ English, Andrew (2006-04-15). "Hydrogen island". The Daily Telegraph. Retrieved 2008-08-25. ^ Yamaguchi, H.; Nishio, S. (1995). "Water surrounding Jomon-sugi, a mysterious cedar tree growing in Yakushima Island for 7200 years". Journal of the Japan Society of Civil Engineers (in Japanese). 80: 86–89. ISSN 0021-468X. Cryptomeria anglica, Boulter and Chaloner, 1968; a fossil species from Pliocene deposits in Derbyshire, England. Conifers Around the World: Cryptomeria japonica - Sugi. This page was last edited on 29 October 2018, at 18:36 (UTC).